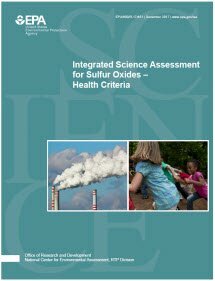 [NOTICE] EPA is announcing the availability of the Integrated Science Assessment (ISA) for Particulate Matter (External Review Draft) for public review and comment in an October 23, 2018 Federal Register Notice (PM). In addition, EPA announced a 4 day workshop webinar to discuss ozone, see the October 23, 2018 Federal Register Notice (O2). EPA has set National Ambient Air Quality Standards (NAAQS) for six principal criteria air pollutants, which include nitrogen oxides, sulfur oxides, particulate matter, carbon monoxide, ozone and lead. Numerous sources emit these "criteria pollutants", which are considered harmful to public health and the environment. Clean Air Scientific Advisory Committee (CASAC), which provides independent advice to EPA on the technical basis for the NAAQS, is the primarily reviewing authority for the ISAs. The CASAC Calendar includes a complete list of past and future meeting details. What are Criteria Air Pollutants?